The dire economic environment is the greatest challenge in advancing more sustainable and equitable communities in California and the Bay Area. Long-standing structural problems with California’s tax system that began with the passage of Proposition 13 have put the state into economic crisis. APEN policy team focuses on advancing structural changes that make the biggest difference in people’s daily lives. APEN is leading new policy frameworks in response to the urgency of climate change and the growing economic divide. Our approach is also catalyzing significant change towards equitable and sustainable communities and increasing opportunities for low-income people. 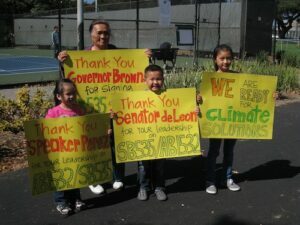 Equitable Implementation of AB32: AB32 states that CARB “direct public and private investment toward the most disadvantaged communities in California and provide an opportunity for small businesses, schools, affordable housing associations, and other community institutions to participate in and benefit from statewide efforts to reduce GHG emissions.” However, in the years since AB32 passed, disadvantaged communities haven’t seen real action to fulfill this promise. Geographic Targeting of Priority Areas: Currently two mechanisms are being developed that may be used by state, regional and local agencies to identify EJ or “priority” communities. Tools such as these that measure cumulative impacts by the census track or zip code level will aid policy makers in their efforts to direct resources to priority communities in California. Distributed Generation: As cited above DG is the single most effective tool to democratize the energy system. APEN will work to update existing policies related to DG and introduce policies that increase DG penetration, in low income and communities of color. Climate/Green Jobs & Economic Development: Policies supporting a range of programs that make training, apprenticeships, and other workforce development resources in the renewables industry accessible to low income immigrants and communities of color. Community Choice Energy: Cities and counties contract with a licensed energy service provider to purchase energy in bulk, build renewable energy generating facilities, and implement energy efficiency programs. This makes it possible to get the greenest energy at the best rates, and keeps prices competitive—and affordable for low-income residents— while investing in renewable energy generation and energy efficiency with full citizen oversight. Renewable Energy and Energy Efficiency Financing: Programs like Energy Upgrade CA, PACE and on bill financing are growing and must be nurtured. Unfortunately, they still leave a vast portion of the population behind thus creating a green divide. Other financing tools need to be explored and expanded so that they penetrate into lower income communities and multi unit buildings. Limiting Dirty Crude Imports: The era of easy oil is over and refineries in CA are looking to import heavier grade crude and “tar sands” oil into the state. The potential impact on GHG emissions and EJ communities is significant. Regulations need to be put in place to stop or at a minimum significantly limit the amount of this type of commodity entering California. For the past several years, APEN has advanced a proactive equity and sustainable community agenda through several significant policy advances in Oakland and Richmond. Oakland Energy and Climate Action Plan: the city council approved one of the highest GHG reduction targets in the nation and included strategies that promote equity such as Transit Oriented Development, Bus Rapid Transit, and affordable housing development near transit sites. Richmond General Plan: the city council approved a visionary general plan that sets Richmond on track to be an equitable and green city.